DNA-72226 [Mac] Blurry zoom indicator with disable-gpu switch. 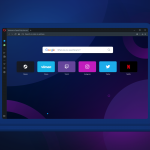 If you’re using Opera on a system with multiple user accounts, you might get an “Opera quit unexpectedly” message when starting it from some accounts. We’ve already fixed this issue, so this update provides the solution. You might have to reinstall Opera to get it working. Sorry for the inconvenience.